Testimonials: What our guests say :) – Angel House Ubud. Boutique 3 suite hotel or Whole Villa Rental. Authentic Bali experience. Unique Accommodation. Feeling of home – Top notch! I booked initially 2 nights and extended for 3 more. There are 3 accommodations around this small luxurious garden with refreshing swimming pool with clean and fresh water; good for a swim in the morning or after a day of sight-seeing. Everything was perfect, the team is so welcoming, friendly and professional; breakfast (large choice) is delicious with organic ingredients and mainly homemade. The bedding is so comfortable. They pay attention to details in the rooms and it is very clean and neat. Garden is well maintained. The House is located in Mas, 10-15’ drive to Ubud center, perfect location for those who want to stay away from busy touristic city center; yet close. The best is to rent a scooter (they can arrange it for you) to get around Ubud and do sightseeing; or the staff can provide drop off/pick-up to/from Ubud. The Internet is very good and fast; if you need to do some work that’s also convenient. So if you’re looking for a friendly cosy and quite environment, don’t look any further, that’s your place! Thank you thank you for the nice time spent there! We loved everything about Angel House Homestay from the moment we arrived. The location is perfect; nestled in a small village with many art galleries and crafts yet close to Ubud. There are many places to eat within walking distance which can be quite helpful with children after a long day of site seeing. The staff was absolutely wonderful. They made us a delicious breakfast each day and kept our room immaculately clean and decorated with beautiful frangipani flowers. Annie will help with setting up guides if you need and is a wealth of advice for traveling around Bali. Stay here and your stress will melt away! Traveled to Angel House Bali in January and stayed there for 6 nights. The accommodation itself is flawless. The beds are comfortable, the kitchen is great, the pool is amazing and everything is kept extremely clean by the most friendly housekeeper you would hope to meet in Bali (Kadek). During my stay the staff made every effort to ensure my stay was comfortable and I had everything I needed. They also took the time to offer their help and knowledge about the surrounding area, such as which restaurants to visit, how much things should cost etc. From speaking with them I also learned a lot about the Balinese culture and thoroughly enjoyed their company in general. I would definitely recommend this place to anyone travelling to Bali. Many of the hotels and apartments seem to be a bit run down and I would never have learned as much as I did if I had stayed anywhere other than Angel House Bali. –Nicht direkt im Zentrum, aber die Gegend an sich ist trotzdem gut, Restaurants, Supermärkte etc. genau vor der Haustür. Wir konnten problemlos ins Zentrum trampen. 5/5 a month ago on Google– Angel House, Amazing staff, great location . Couldn’t possibly ask for more. We love staying at Angel’s House! The staff is friendly and always willing to help (even after their working hours), the rooms are clean and beautifully decorated. We found someone who didn’t take us as tourists but rather as a part of their family. This is the reason why we felt safe and calm even there was a possibility of volcano eruption. Wonderful boutique B and B. Cosy hideaway from the hustle and bustle of Ubud. Hosts are wonderful being full of knowledge regarding Bali and local culture. Staff are very helpful and attentive. Angel house team really made us feel at home: having a little talk here and there, getting super delicious home-made breakfast, enjoying the little garden with pool and sleeping in a comfy bed in a very cosy, clean and lovely decorated room.. to only give an idea. The place is located a bit out of Ubud in a friendly neighborhood, definitely worth exploring. We rented a scooter or taxi to get to other places around. Annie’s team was very helpful with that and everything else we needed from arrival to departure. Next time we’re in Bali we will definitely stay here again. No other accommodation, from rented villa to 4star hotel could keep up with our stay here. Even though we felt very welcome anywhere on the island, nothing could top their hospitality! Rod & Annie have a real gift for hospitality along with their beautiful Balinese staff. My husband and I have stayed her multiple times and have always been impressed. It is to the point now that we walk in, breath a sigh of relief and feel instantly at home. Home far away from home – an oasis! Angel house was amazing, we only booked for 3 nights but ended up staying 7! The room was beautiful and the staff were amazing, they were there for whatever we needed but never intrusive. Breakfast was delicious and good coffee, and I HIGHLY recommend the jummu (Balinese health drink) it was the little details that made the difference, having access to the fridge and little kitchen, free drinking water, massive DVD collection (wet season in Bali with 2 children) made all the difference. 100%, after three weeks of hotel hopping across Bali, Angel house was a welcome slice of paradise. It’s a little tricky to find the first time, so check your maps, but once you so its fairly easy to get around. No taxi though. So hire a scooter or a driver. Also highly recommend Canting Balinese cooking school, they pick up and drop of from the home stay. This review is the subjective opinion of a TripAdvisor member and not of TripAdvisor -LLC. My family and I just spent 14 days at Angel House. We stayed in the Sandat Suite- the main bed was very comfy for us, and our 2 girls (aged 3 & 4) shared the fold out couch. The bathroom was generous and everything wa spotlessly clean! We swam in the pool every day, but the DVD player (complete with kids movies) came in handy too! Highlights were the home-made breakfast (banana pancakes and Bali coffee-yum!) walking to the local market, and enjoying the ‘real’ Bali away from the main tourist strip. The staff were delightful and made our stay so enjoyable! THANKYOU Rusma, Luna, Kadek, Annie & Rod. It’s called Angel House because the owners are angels! Lovely stay! Angel House is a lovely stay! Our family of four rented 2 rooms, and we were very comfortable. I had typhoid on arrival, and was gearing up to find out where the nearest hospital was. Then, Annie came to my rescue! She is a nurse, and helped me above and beyond what I would have expected anyone not in a hospital/clinic to do for me! She took my vitals, and brought me electrolytes, medicine and antibiotics. She consulted the pharmacist to ensure her analysis of my condition was accurate. She came repeatedly to check on me, and even brought me a sarong to wear that was more comfy than the clothes I had. I am the travel planner of my family, and since I was out of planning commission/rallying power, my family didn’t initiate any travel around Ubud during our stay. However, they were totally entertained regardless in the adorable pool and relaxing in Annie’s gorgeous gardens. By the time we left, I was feeling much better. As we drove away and I observed the interesting neighborhood, I began wishing I hadn’t been ill, and could have been getting attention from Annie in the form of the gallery recommendations instead, as there are many in the area! I would recommend Angel Ubud to anyone looking for a comfy, quaint and unique garden place that can also offer authentic heart-felt travel advice! If you are searching for a place to stay in Bali, search no more. My family and I had the most wonderful time at Angel House. Everything about our stay was perfect. It is nestled in a cool little village called Mas with lots of art galleries and crafts. We walked to restos and warungs every night to eat. All this and you are still just minutes in a car from Ubud. Annie treated us as family rather than guests from the moment we arrived and this made us feel so at ease during our stay. Ibu Rusma and Ibu Luna make the most fantastic breakfast. They kept our room immaculate and decorated it with beautiful Frangipani flowers everyday. Annie is so knowledgeable about Bali and the culture. She gave us such awesome advice on navigating our way around and places to see. My husband went diving out on the east coast and the diving company said the drive would be 1.5 hours, Annie said it would be more like 2.5 hours. Guess what? It took 2.5 hours just as she said. She will help set up drivers and guides for you to make your vacation so much easier. On my last day, she set up a Balinese cooking class for me and it was one of the highlights of my trip. Oh and one more thing! 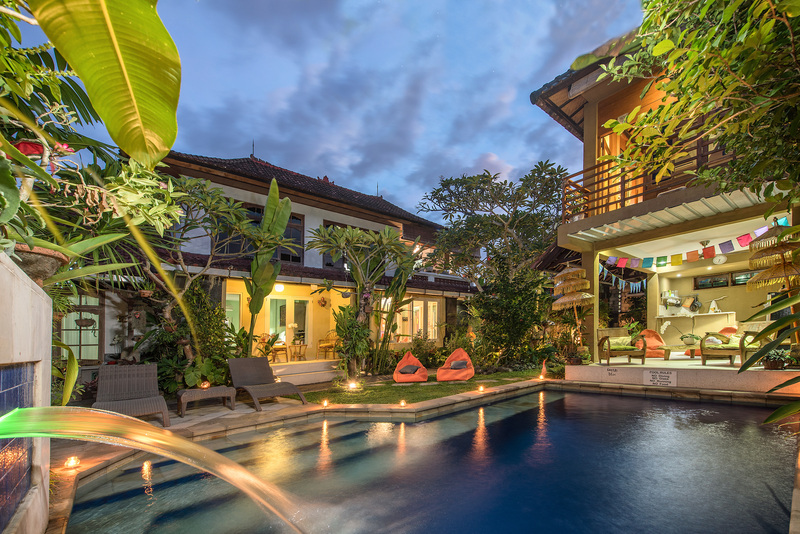 Many of the villas in Bali have an open bathroom concept, Angel House has enclosed bathrooms. Just remember you are going to Bali and there are many creatures! I love creatures but I was very happy to have an enclosed bathroom.